All DK Custom Outlaw Air Cleaner Systems have an EBS Included! What is an External Breather System? EPA mandates have Harley-Davidson, & almost every aftermarket air cleaner company, pushing the blow-by into the air cleaner. The blow-by that comes out of the breathers is primarily exhaust gasses and oil, it is also hot. This is counter-productive to performance & engine longevity. 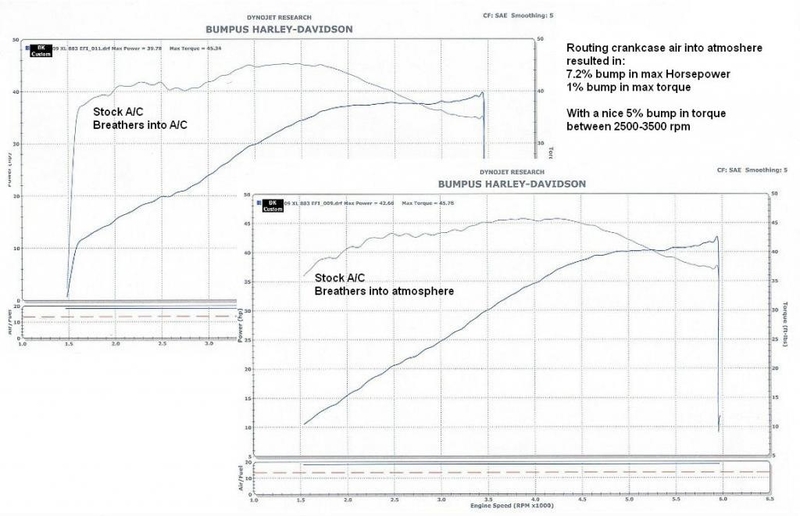 Harley engines perform better with cool dry air & gasoline, not hot, oily air and gas. An EBS routes this hot, oily, oxygen depleted air to the atmosphere, instead of into the combustion chambers via the air cleaner. 1. How does an EBS Increase Engine Longevity? Simple! It only allows clean air into the engine! 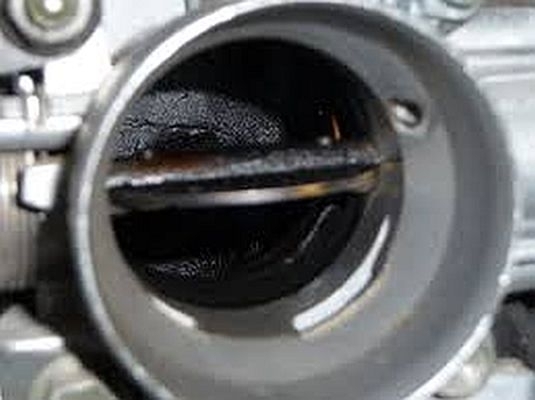 Most air cleaners route the oily crankcase air into the air cleaner, which then goes throught the carburetor or throttle body, and then into the combustion chambers. 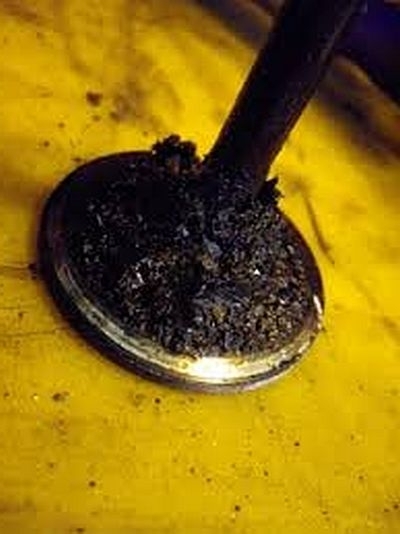 Since the engine only burns gasoline and oxygen, that oil ends up as crusty carbon deposits on the pistons and valves. Periodically, little pieces of this carbon break off and scrapes the cylinder walls or gets stuck between the valves and the valve seats, both of which prematurely wear the engine. An EBS equipped Air Cleaner does not allow any oily air into the carburetor, throttle body or combustion chambers! Photo of the inside of an engine with a stock air cleaner or a typical "Stage I" air cleaner that does NOT have an EBS. Photo of a valve that has very high build up from oil coming through the breathers. Photos of the glop that was drained from an EBS Catch-Can. 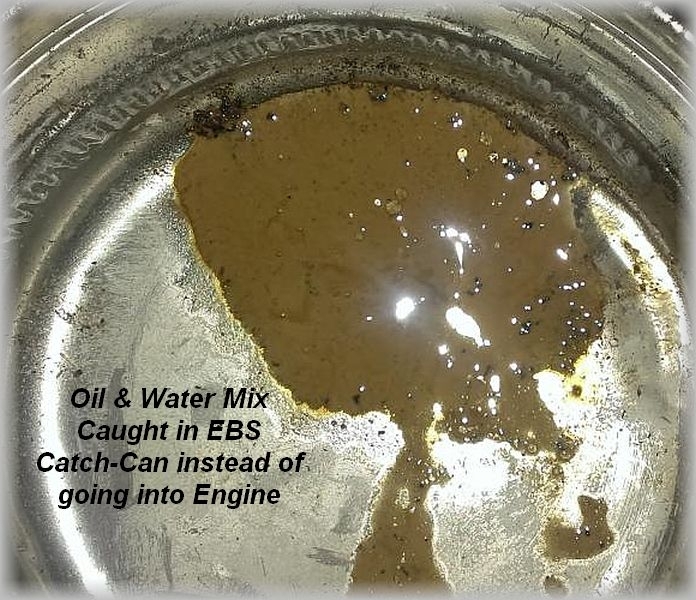 This oil-water mix would normally go into the throttle body/carb and then into the combustion chambers. With an External Breather System, it keeps this mess out of your engine! 2. How does an EBS Increase Horsepower & Torque? Gasoline engines make power by burning a combination of oxygen and gasoline. With an EBS equipped Air Cleaner, only gasoline and oxygen rich air enter into the combustion chamber. With an EBS equipped Air Cleaner, the air is also cooler. Cooler air is more dense. More dense air contains more oxygen, equalling more power on each combustion stroke. You may have noticed that your Harley runs stronger/more crisp in cold weather. That is because the colder the air, the more power. Search "cold air intakes", you will see that folks spend hundreds, sometimes thousands, to get cooler air into their combustion chambers in order to generate more power. With a non-EBS equipped air cleaner (all stock & most aftermarket, like the SE, Big Sucker, etc.) there is oxygen depleted HOT air and oil going into the combustion chambers. Not only will this not burn, it also takes up space that would otherwise be occupied by oxygen rich air & gasoline, thus reducing Horsepower & torque. 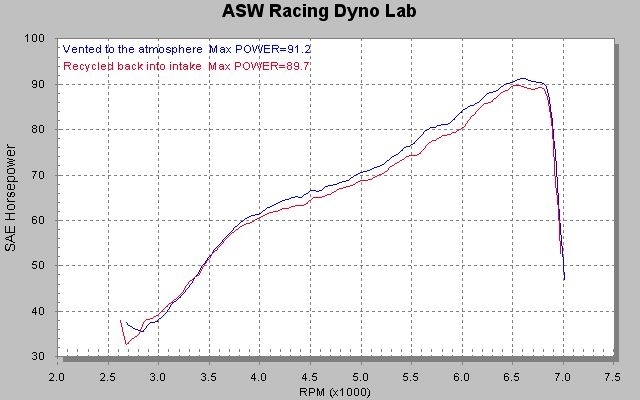 Dyno Charts showing the Increase in Power achieved by venting externally, via an External Breather System (EBS). 3. How Does an EBS help keep your bike in Tune? Tune Stabilization. We hear it everyday! "My bike was running great 6.000 or 8,000 miles ago. I have not done anything to it, but it just is not running as good as it used to. I took it to my mechanic and he says it needs to be dyno tuned, again." That is not because the tune changed, it is, more than likely, because either the compression ratio changed, the carburetor got gummed up, or the throttle body and sensor got gummed up with the oily air passing through...usually Both! 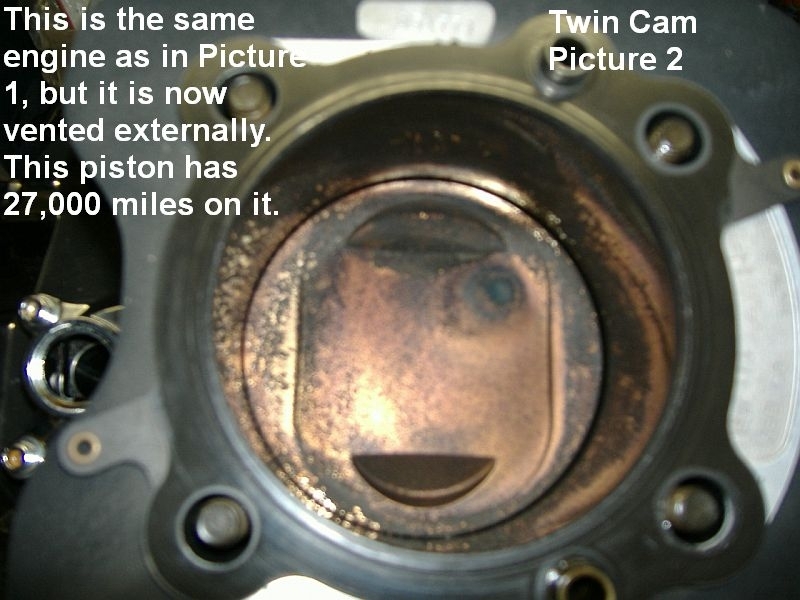 When there is carbon build-up on the pistons, this increases the compression ratio. If your bike was running great before the carbon build-up, then after the carbon build-up, that tune that made your bike run great is no longer matched to the increased compression ratio, resulting in a poorer running bike. If the carburetor or throttle body/sensors are gummed up, they cannot function properly, resulting in a poor running motor. With an EBS equipped air cleaner there is no oil being fed where it does not belong. There is no change in compression ratio, there is no gumming up of the intake. There is no need to constantly re-tune the bike just to keep it running well. Photo of a gummed up intake, due to oil the breathers being routed into the air cleaner. All Stage I Air Cleaners are NOT the same! 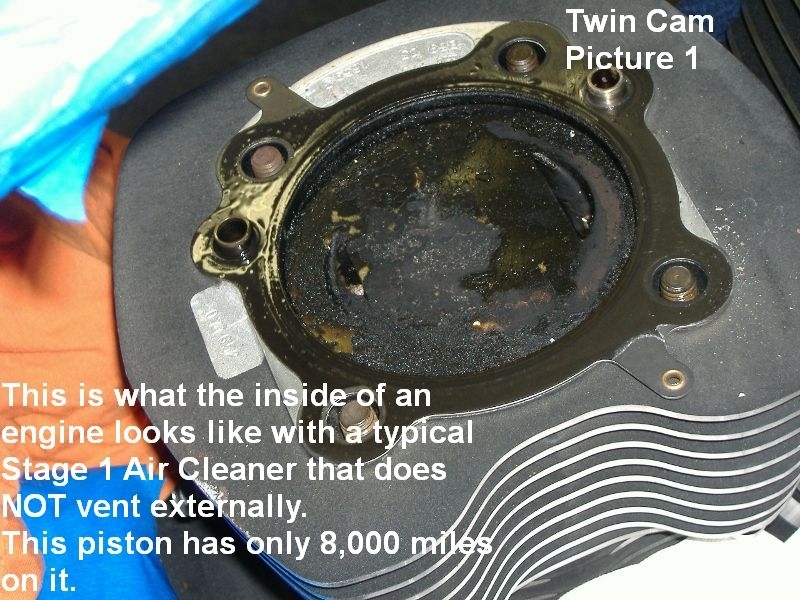 Most "Stage I" air cleaners route performance robbing hot, oily air back into the engine. Our Outlaw Air Cleaners, Velocity Stacks, and Optimized Air Cleaners are true Stage I Performance Air Cleaners that allow only clean cool air into the intake. You can see them HERE. If you already have a free flowing air cleaner that you are really attached to, we likely have an External Breather System that will work with it. That way you can keep it AND get better performance and longer engine life. 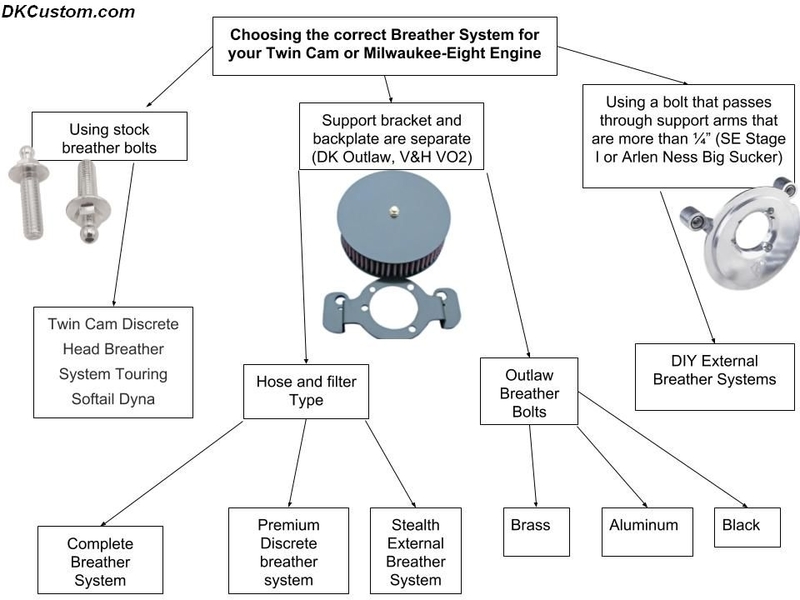 Click HERE to see our selection of EBS kits to optimize your existing air cleaner. Breather Bolts that have a filter built into them. These are good for most Sportsters, Big Twin Evo's and Twin Cam 88 & 96. Some Twin Cam 103's do very well with them also. If your engine does not have excessive oil coming out of the stock breathers, then the small filters in the Breather Bolts will work well. Hose & Filter/Catch Can style EBS. These work well with all Harley Engines. There are many variations (seen in the link above), and they all keep the hot, oily, oxygen depleted air out of the engine. The filter is designed to absorb it and prevent it from dripping on the ground or spraying on the bike. 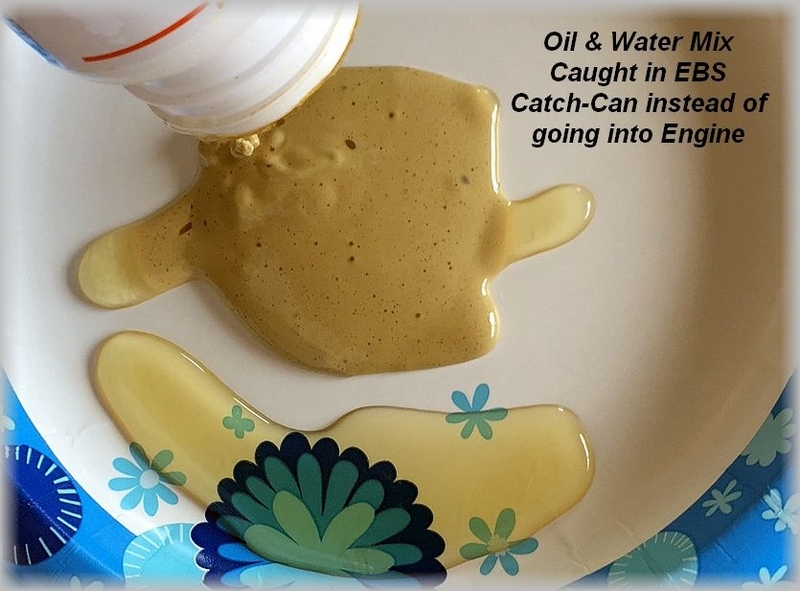 If a Catch Can is used instead of a filter, the oil collects in the Catch Can for future dumping/inspection.